Nick, Hank, Monroe and Rosalee work to stop a mask maker who is targeting wesen to create luchador masks that give the wearer great power; Renard considers an offer. Monroe's "Hey, it's Patrick" was the highlight of the episode for me. Nick's journaling dialogue was the lowlight, so clunky. I have never really gotten the appeal of luchadors. (Seriously, those masks are fugly, and aren't they way hot on your face when you wrestle?) But it is certainly a fitting plot for vesen-related activities. Still not caring about the mayor plot. Eve still a creepy robot. "Oh, we found a magical healing stick, let's hide it and never speak of it again" whaaaat? Rosalee speaks Aramaic but not Spanish, huh? I liked what the AV Club review had to say about it: "It feels abrupt and almost resigned, as if the writers are admitting fun’s been had but it’s time to get back to work." Yup. I kinda liked this one; I always did like the monster-of-the-week ones, especially compared to the tedious Royals mythology ones. (I'm convinced that they dead-ended the Royals because nobody cared about those plots.) And this one delivered on the creepiness, too. Rosalie yada yadas the ceremony: and I think the AV Club is right here, since the trailer burned the show's been relying too much on "hey, let's go ask Monroe and Rosalie" for what-is-this-wesen-and-how-do-we-deal-with-it exposition. 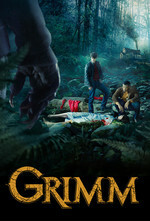 I liked that Nick is starting to write his own Grimm book! And I didn't mind the hokey Doogie Howser voice-over; it felt like a nice mirroring callback to the regualar scenes in earlier series in which Nick (or Monroe or Hank or etc) would read aloud from the book. I like the idea of Nick adding to Grimm lore by writing his own book, I just found the dialogue itself kinda clunky. Nick isn't the most eloquent guy, so I didn't mind that. He did start his own from book in season 1, but that probably got destroyed with the trailer. This is like the first time we see him continuing it since then. I'd be interested in the royals if they'd just ever EXPLAIN the damn royals and what the hell that all is. Are they vesen royalty? Regular ol' royalty like we have in our world with European countries? What's the connection? What's the point? Likewise, if they want me to care about the mayor or Rosalee's druggie stalker, I'm gonna need a reason. Theory about the magic stick: it "cures" wesen so that they are no longer wesen. Hence, Monroe is no longer wesen. I can't imagine the writers being willing to give up the resource of Monroe's wesen powers. I could buy the magic stick having some use in banishing Adalind's hexenbiest permanently, like maybe it's effects are influenced by the wielder's intent, or only affects wesen in active woge mode. Well the preview for this week's episode already shown that there's some were-blutbad that Monroe will battle as a blutbad, so his wesen-ness is not lost. They revealed the Mayoral plot, didn't they? That Black Claw wants Renard to be their candidate so they can control the city. I imagine after setting up all those riots, their next move is to infiltrate governments using these riots as a platform. They already started with the foster care program in Portland to indoctrinate Wesen children. Once everything is in place they will reveal Wesens to the world and take over. It might be a tad predictable, but perfectly sensible for a group to plant itself in all facets of life as part of its plan.